Dr Blood's Video Vault: Danny meets the twins! It's "Terror Tuesday" again already so what better way to make you soil yourself today than with one of the most terrifying scenes from "The Shining"? 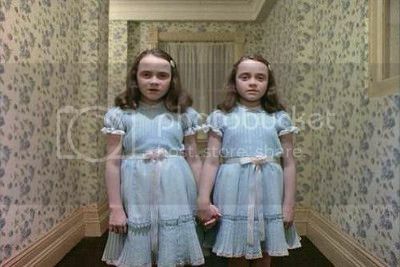 Kids are horrible enough anyway, but putting a couple of freaky-looking ones in even uglier dresses and sticking them at the end of a corridor was a master stroke by Stanley Kubrick. 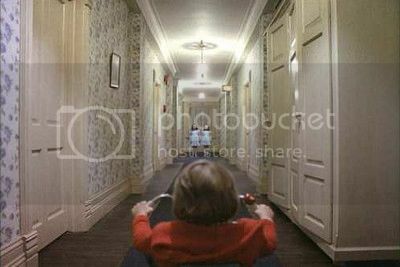 As if there isn't enough creepiness seeing little Danny Torrence (Danny Lloyd) trundling round The Overlook hotel on his tricycle, suddenly the Grady daughters are just standing there inviting him to play with them "forever and ever"! 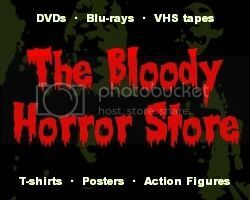 As some of my horror blogging brethren would say, "Pants will be shat!" 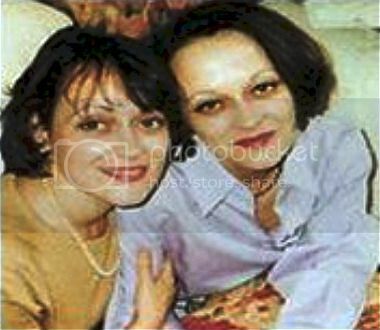 Lisa and Louise Burns are even scary in a still image without the intercuts of their characters' dead bodies and all the blood. In case you are wondering whatever happened to them since "The Shining" (1980) was their first and last movie, Lisa went on to get a degree in Literature while Louise became a microbiologist. They also grew into their looks and turned out to be rather pretty.